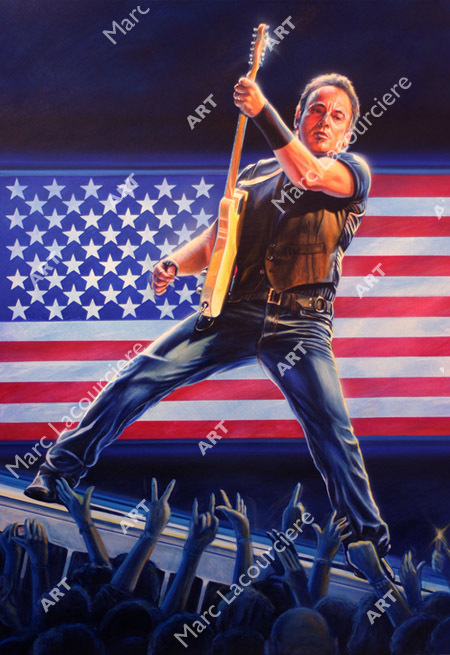 When I hear his name, the first thing that comes to my mind is the song “Born in the U.S.A.”, written and performed by Bruce Springsteen, in 1994. It’s one of his best-known singles and is ranked as one of the greatest songs of all time. Lyrically, the song deals with the after effects of the Vietnam War on Americans; although it’s widely misinterpreted as a patriotic anthem. It was very easy for me to visualize this painting ahead of time by placing the American Flag in the background – expressing its true meaning of pride.